One Angel Square is a striking new and modern building constructed in Manchester, England. It serves as the head office of the Co-operative Group. This new building is also considered as one of the most sustainable large buildings in Europe. It acquired the BREEAM “Outstanding” rating, with a world-record score of 95.32 percent. The building garnered several awards by virtue of its design and sustainability features. 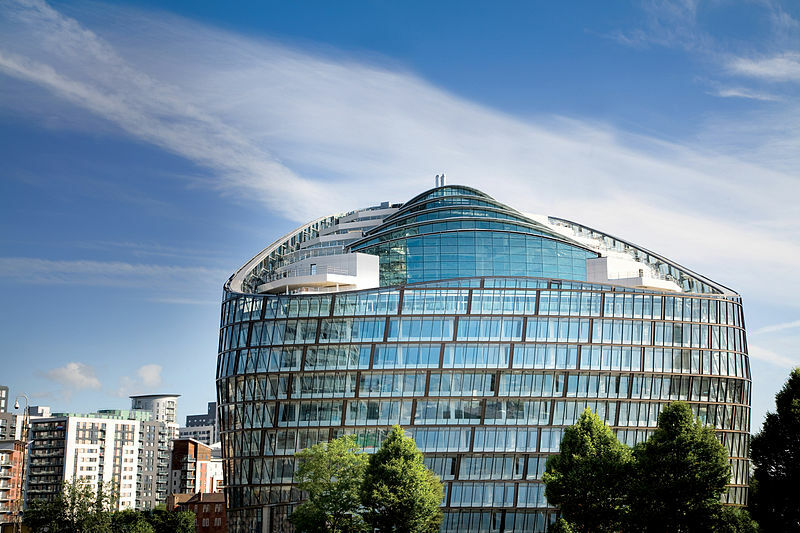 One Angel Square was first conceived when the Co-operative Group announced in 2007 its plans to moves its headquarters in the Greater Manchester area, spurred by the incredible growth in terms of membership and revenue experienced by the organization. But then in 2008, the group announced that it will not be leaving Manchester city centre and will instead develop the land area opposite its existing head office. In 2010, the Co-operative Group announced its plans to regenerate the 20-acre site with office, retail, hotel and residential space as a way to encourage visitors into the city centre. The project is to be called the NOMA or North of Manchester city centre project. The first stage of the plan will involve the construction of One Angel Square. Initial construction of One Angel Square commenced on July 2010. Architectural firm 3DReid designed the building with the objective to build a green, landmark building for the city. The building was topped out in November of 2011. The project was initially scheduled for completion in September 2012. However, problems on the fitting out process caused delays. The building was completed on February of 2013. One Angel Square stands 72.5 meters or 238 feet high. It has a total of 15 floors and occupies a floor area of 327,643 sq feet or 30,439 sq. meters. One Angel Square is considered as the largest building in Europe to gain a BREEAM outstanding distinction. For its high rating, it is considered as one of the most sustainable large buildings in the world. The design for the One Angel Square has been compared to a sliced egg or a ship. Its distinctive design was first conceived by 3DReid lead architect Mike Hitchmough as a notebook sketch and was further refined and developed. It features a diagonal slice on top that creates a nine-floor high atrium with a glass roof that is tilted towards the south. The purpose is to maximize the use of daylight and for passive solar gain. The structure is composed of three internal concrete cores that form an equilateral triangle. It also features a double skin facade exterior with a cavity between the inner windows and the outer glass panel structure. The purpose of the unique exterior is for sustainability and aesthetic reasons. The outer glass panel structure offers greater control of heating and ventilation and accentuates the three curved corners of the building. The open atrium collects heat from the sun, providing a means to heat up the building without using carbon fuel. There are louvers or horizontal slats built above the double skin facade that opens up during the summer to let the hot air escape and prevent the building from overheating. The louvers are closed in winter in order to maintain the warm air that the building generates. One Angel Square also has a power plant that uses bio-fuel and waste cooking oil for fuel. Waste heat from the computer systems used in the building is recycled. The building also makes use of a water recycling system for rainwater harvesting.